The Inter-Team & Inter School Cricket Championship (Men, Women & Boys) concluded today at Telco Cricket Ground. The championship is organized under the aegis of Tata Motors Sports Department. Little Flower School (LFS) team won the title in the inter school (boys) category, Indigo Fighters in Men and Prima Challengers were crowned the in the women category. In the final match of the inter school (boys) Little Flower School clashed against Vivek Vidyalaya. Little Flower School won the toss and opted to bat first and scored 141 run in 20 overs loosing four. In reply Vivek Vidyalaya were all-out for just 52 run only in 10.5 over. Little Flower school won the final by 89 runs. Master Sujal Kumar Sinha of Little Flower School was adjudged the best player of the tournament for his 56 runs and 8 wickets in the series. In the final match of the inter team (Mens) Indigo Fighters took on Prima Challengers. After winning the toss Indigo Fighters elected to field first. Batting first Prima Challengers scored 112 run in 20 overs and loosing 8 wickets. Indigo Fighters began their chase by losing three quick wickets with just 30 runs on board. But their fourth wicket partnership of 59 runs helped them win the final match by 1 wicket with two balls to spare. Final match in the Women Category was played between Safari Royals and Prima Challengers. Prima Challengers won the toss and elected to bat first and scored 45/2 in 6 overs. While chasing the target Safari Royals started well but faltered at the end of the match and could only managed to score 35 run in 6 overs with loss of 3 wickets. Six teams in Men’s Category (Prima Challengers, Indigo Fighters, Nano Warriors, Safari Royals, Trans Axle & TACO Riders) and five Teams in Women’s Category namely (Prima Challengers, Indigo Fighters, Nano Warriors, Safari Royals & Trans Axle) participated in the tournament. In the school category total 12 team namely (Shiksha Niketan, ABMP High school, VBCV, Samudayik Uchch Vidyalaya, Vig English, Gulmohur High school, Guru Govind Singh, S K Public, Vivek Vidyalaya, Hill Top, Little Flower School & Valley View) participated. 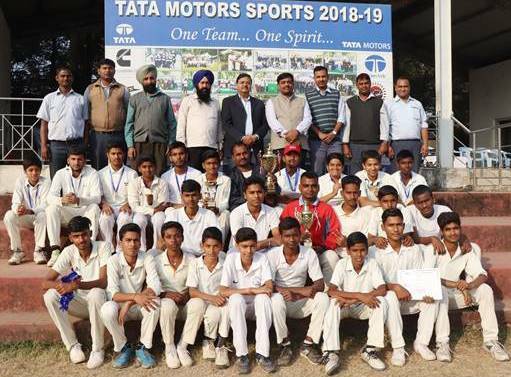 During the prize distribution, Manoj Ram, General Manager (Central Maintenance), Tata Motors was the chief guest and Basab Dutta Jana, General Manager (Plant-Quality), Tata Motors, Rajat Singh, Senior Manager (Security), Tata Motors, Gurmeet Singh, President (Tata Motors Workers Union) and R K Singh, General Secretary (Tata Motors Workers Union) were the guest of Honor & gave away the certificates, medals and trophies to the winners. V N Singh (Head-Town Administration) gave away the trophy to best player of the series to Master Sujal Kumar Sinha.